Typically, I work and plan with great efficiency in all aspects of my life. However, when it comes to design, there are some things that just have to wait, some dreams that don't come true. Exhibit A: My laundry room. 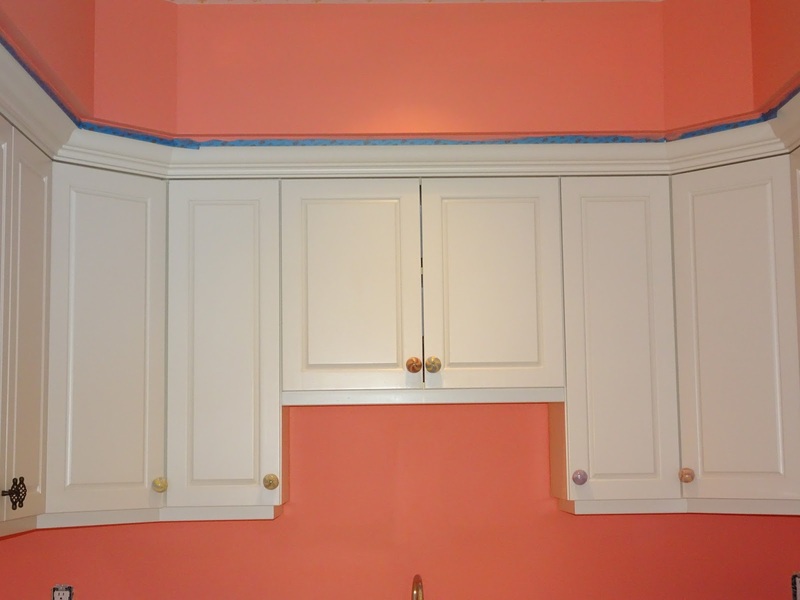 You may recall a post, if you love me long time, about a possible laundry room re-do. 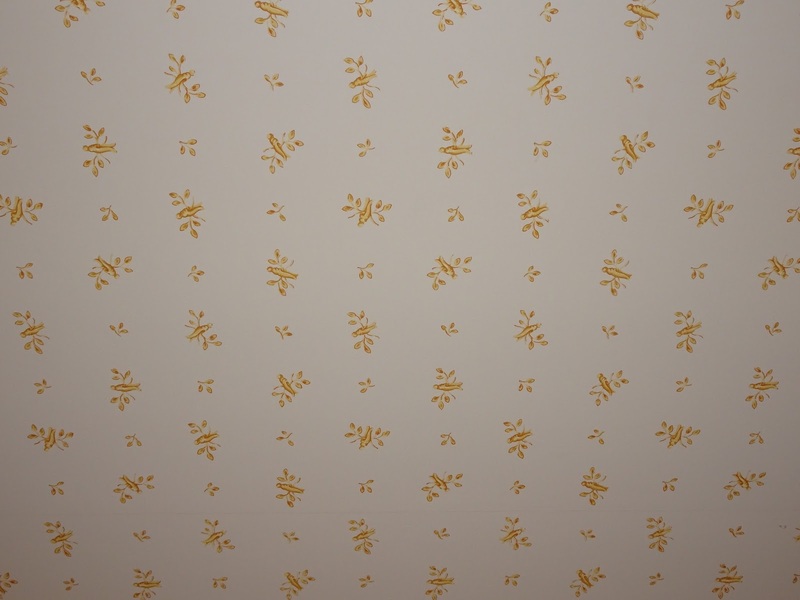 In post #2, I did finally get new knobs, but realized Scalamandre wallpaper was never going to be a realistic option. 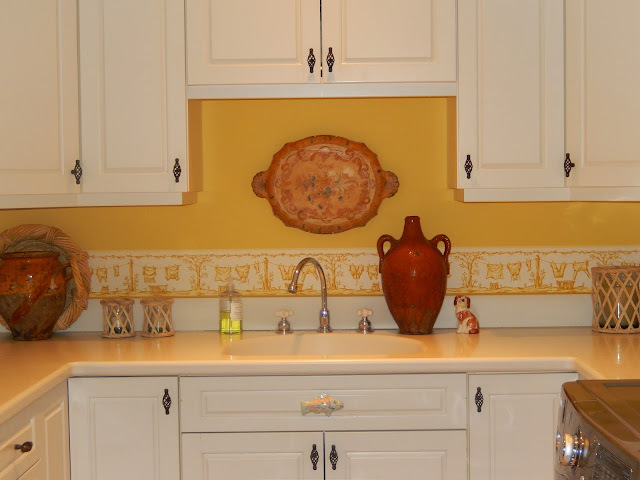 Here's a pic of the laundry room with the original white ceramic knobs, the french country yellow paint, the Brunschwig & Fils laundry themed border, and the french country decor pieces... 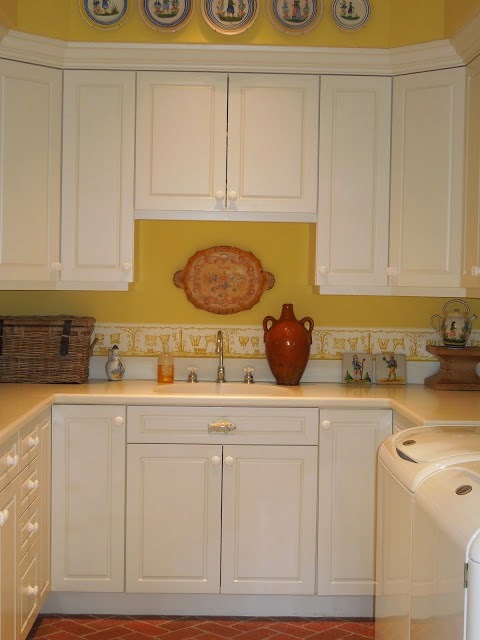 I've loved this laundry room for the past 18 years! 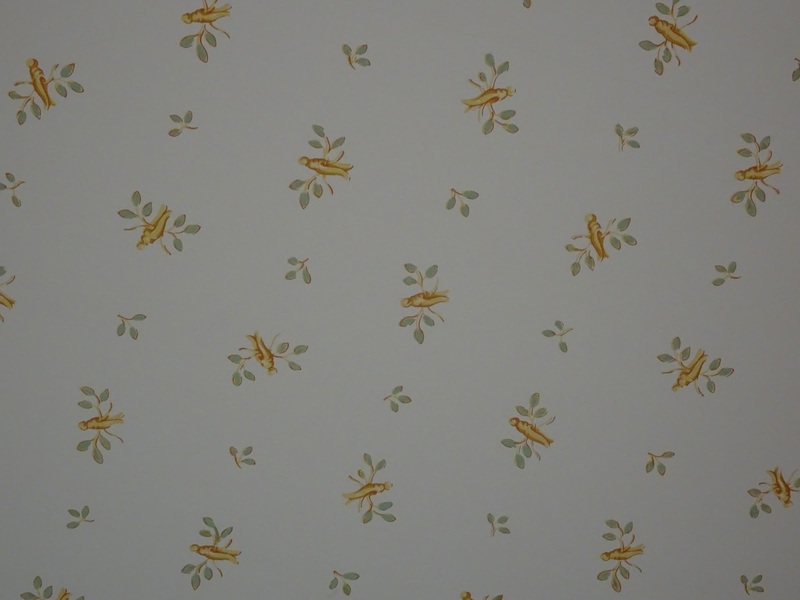 So what's a girl to do, when a Scalamadre wallpaper dream (see Post #2) is squashed by monetary restriction reality? Paint! I was so sick of this drab yellow paint color. 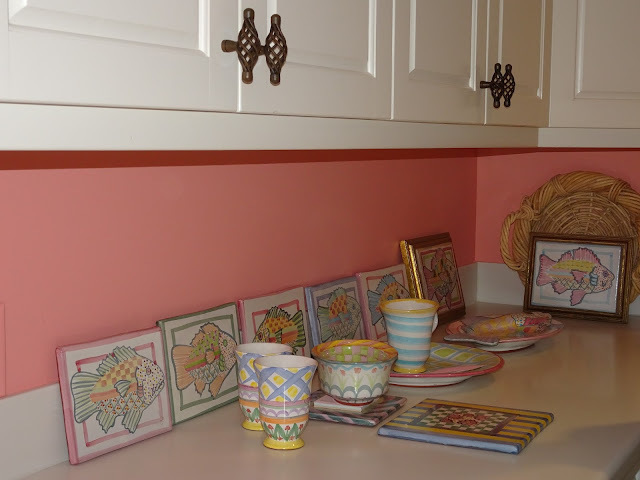 That Bruncshwig & Fils laundry room border was my dream come true 18 years ago, but I was sick of it. 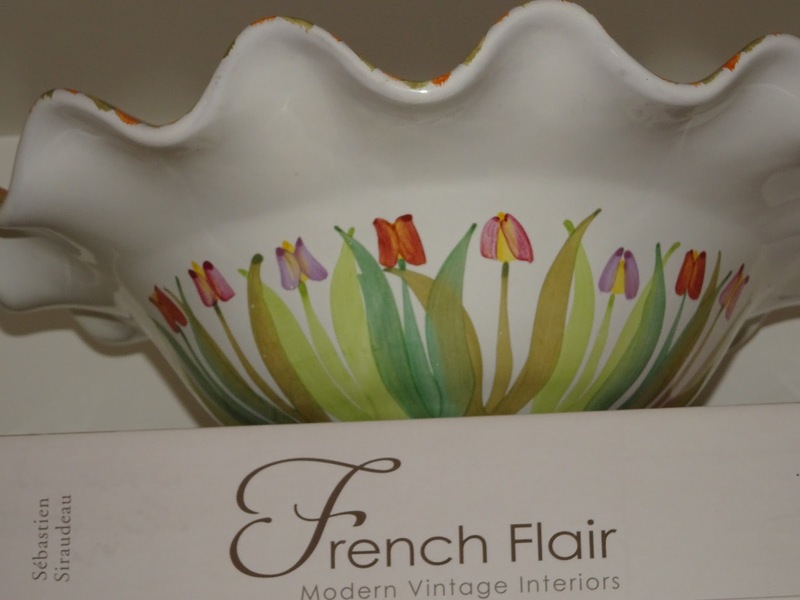 After calling Andy Moore, painter extraordinaire, the excitement began, and that 2012 MacKenzie Childs inspiration resurfaced. 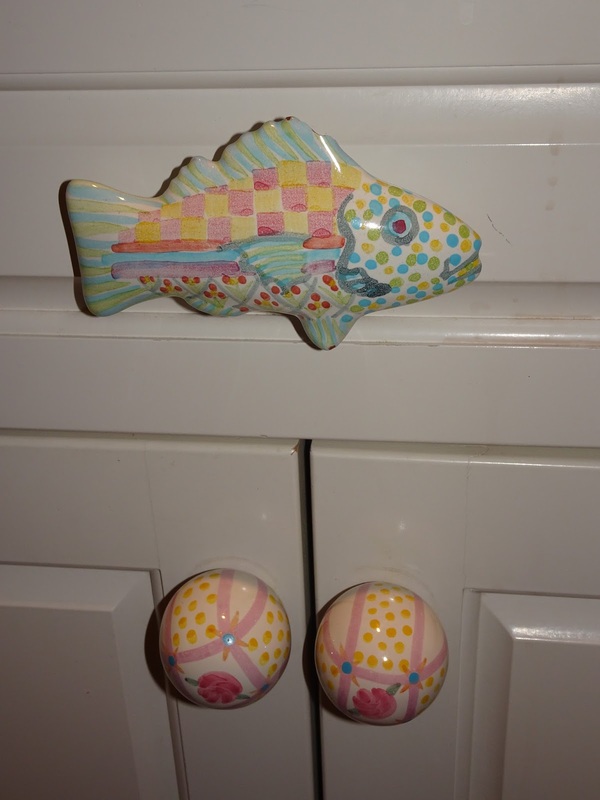 I started on eBay, and found enough knobs to make a splash on one section of the laundry room cabinets ~ front and center. 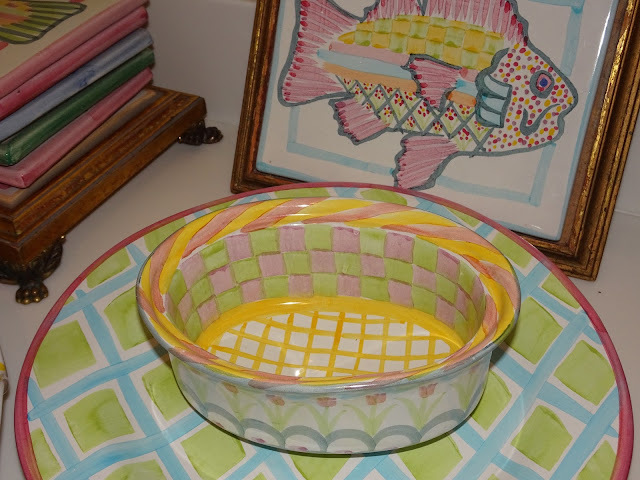 Then, I went through my own collection of MC fish and platters and plates, and pulled some for color inspiration. I removed the Quimper plates and other french items sprinkled around the room, with a planned to add MacKenzie Childs pieces in their place. 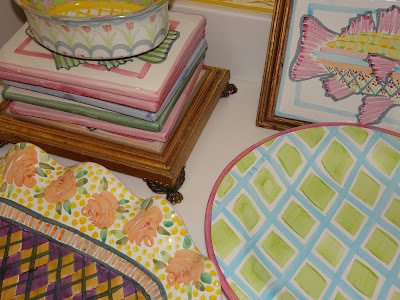 I get very excited about color, you guys. 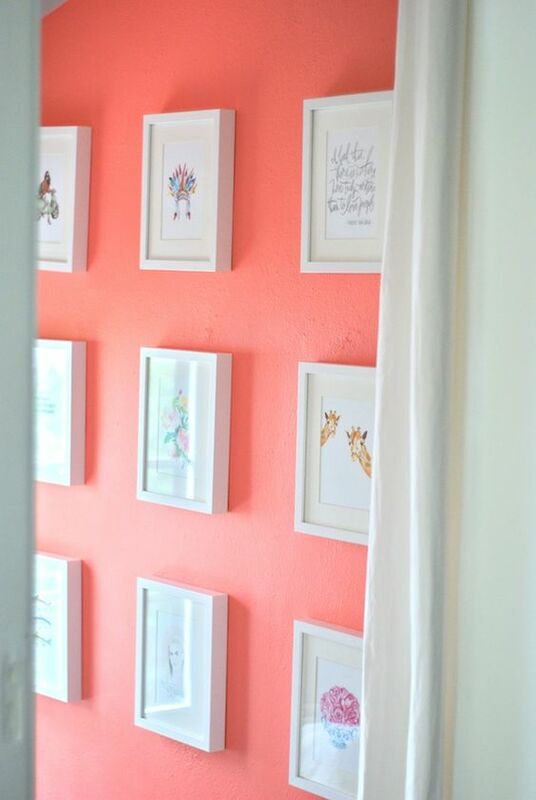 We chose a coral color, and it was a good match to what I had found on Pinterest. But when the whole room was painted, it felt neon. Perfect for Key West, but not quite right for my house. I definitely had an Oh God, what have I done? moment..
To take down the neon quality, Andy added an oatmeal color to the neon coral, which created more of a Pepto Bismol pink. This sounds horrible, but with the MacKenzie Childs pieces, it seemed to work. Andy, who can become a helpful designer while on a paint job, thought maybe I needed all MC knobs to really pump up the room, and make the pink better. So I got to work on eBay. While in search of knobs, I also found a set of 20 MC tiles and another fish platter. 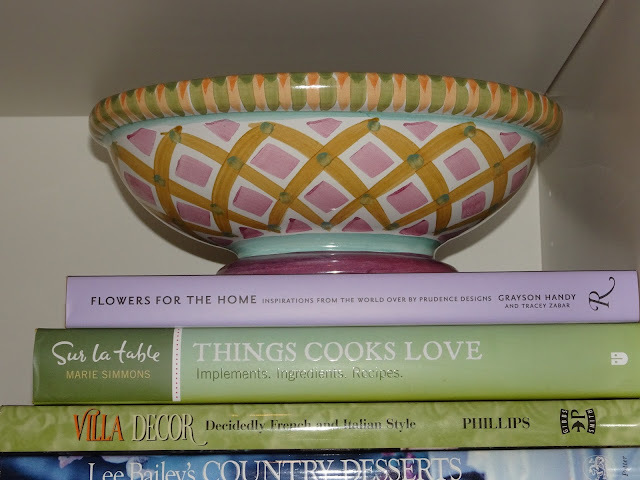 I was really going to turn that laundry room into a MacKenzie Childs Palace! 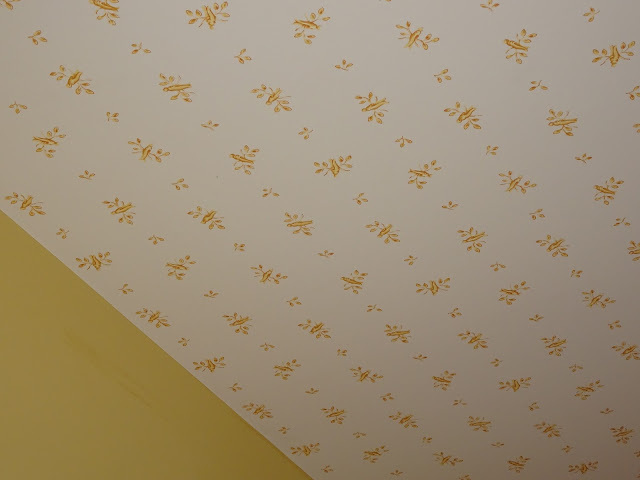 The ceiling had Brunschwig wallpaper with clothespins, and although I was sick of the yellow paint color and the border, that ceiling wallpaper still made me happy. So Andy suggested adding color to the clothespins design... Music to my ears. 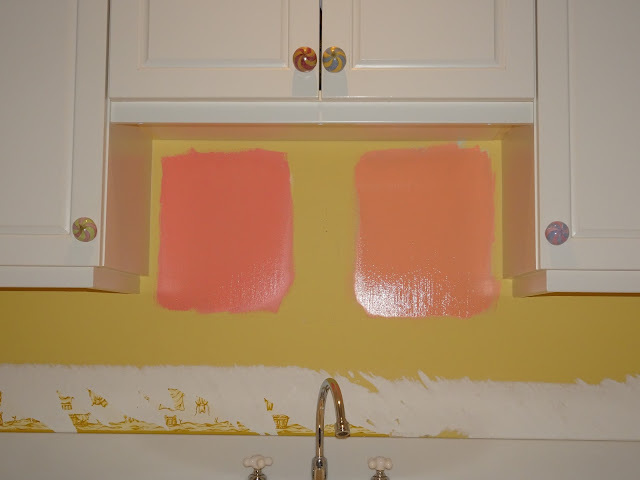 While the ceiling was being painted, and eBay was being searched, the pepto bismol pink continued to bother me. I was losing sleep. And then, at 2:30am, I found this! Stripes is just what this pink needed. You guys, I tried and tried to stay excited about this pink. 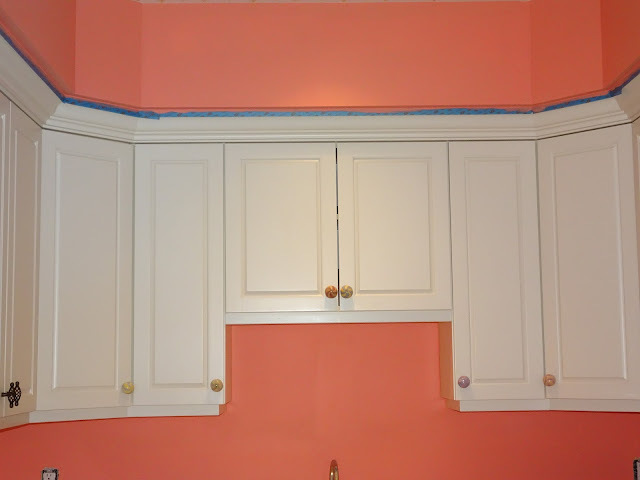 I talked myself into loving it with the stripes, but the bottom line is, the pink paint just wasn't right. Did I really want to keep this story going with the addition of stripes? No, I did not. Finally, I have resorted to taking a loss, and doing wallpaper over the pink paint. I've held up the Scalamandre (if autocorrect changes Scalamandre to Salamander one more time...) wallpaper sample, wrinkled at the edges from years of love and dreams, and I still adore it, but do I really want to spend that much on wallpaper for my laundry room? Certainly there are more reasonable options. 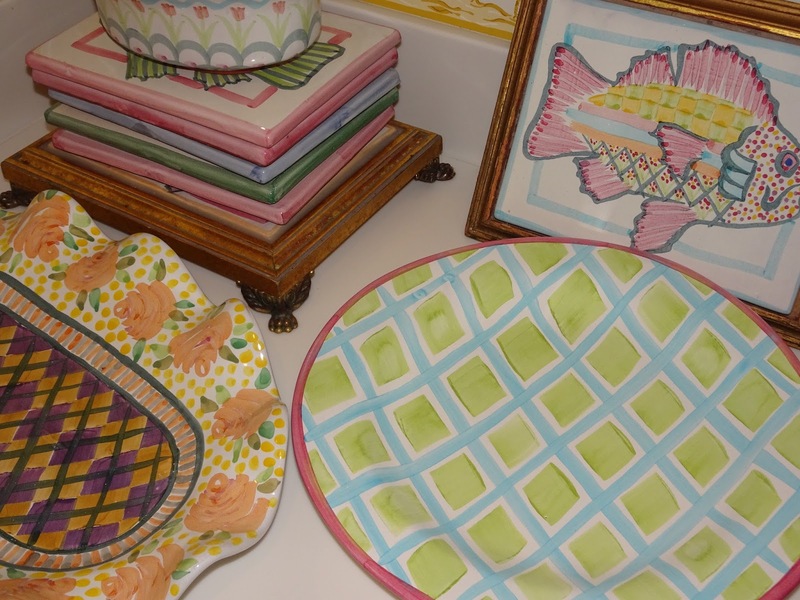 What will I do with all the MacKenzie Childs pieces I purchased on eBay? 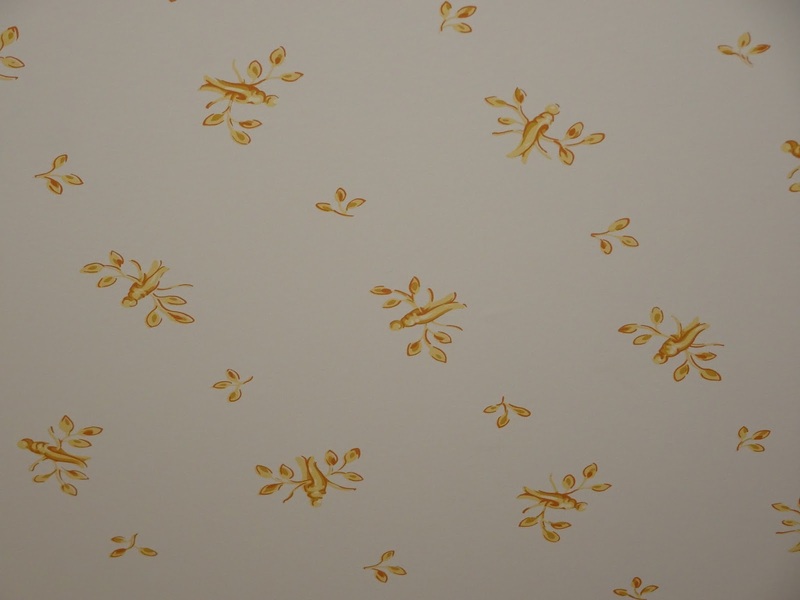 What about the ceiling wallpaper with the new green leaves? I confessed to my husband. I told him I hadn't made very many mistakes in decorating, but I went big on this one. I told him we had to fix it. Now that the panic has passed, and the confession is complete, relief has swept over me, and I'm going back to the drawing board. 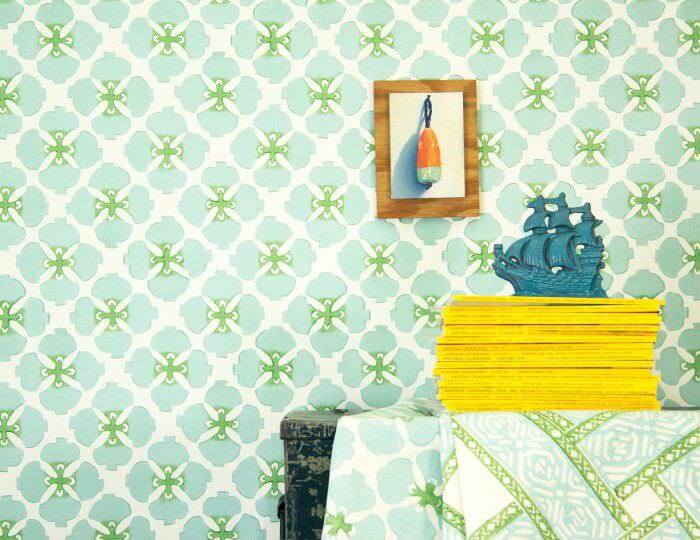 The Pinterest board of wallpaper! I've revisited some wallpaper ideas, requested some samples, and am finally able to sleep. The possibilities are endless! 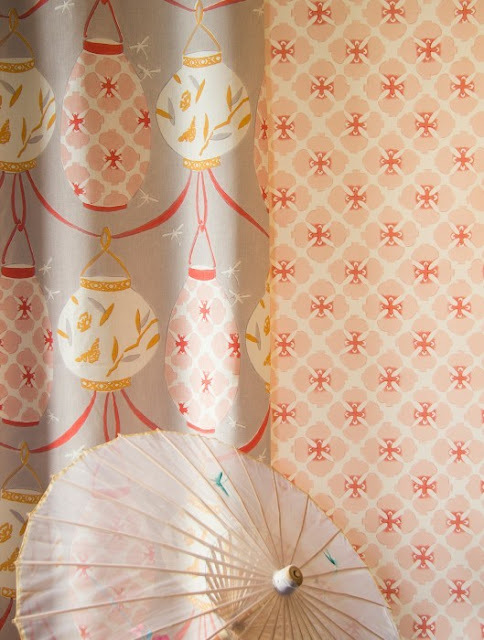 I plan to make my way through wallpaper samples, and I will let you know how the next phase of this exceptionally long and dramatic laundry room story ends. 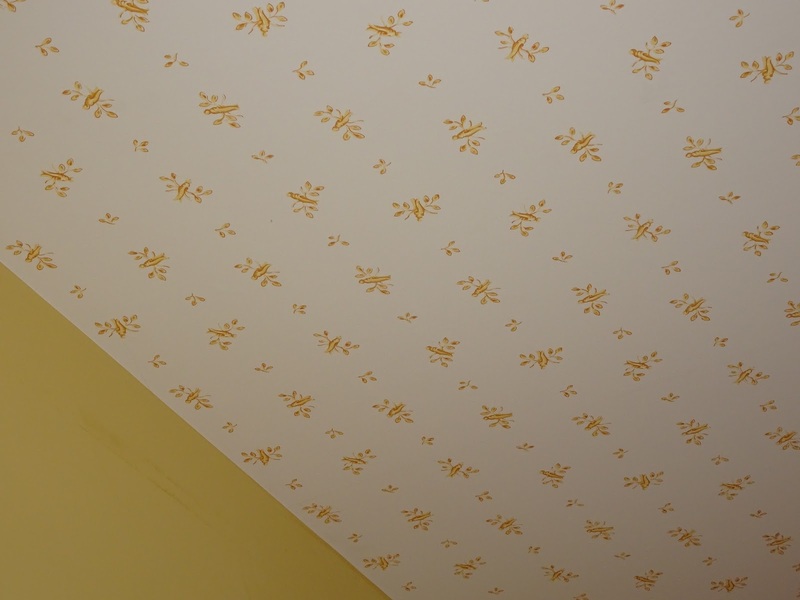 Stay tuned, and wish me luck with the wallpaper search! 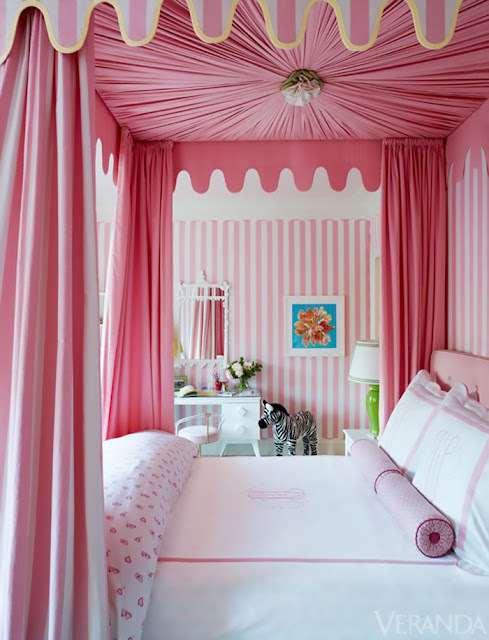 In the mean time, I will be living with my Pepto Bismol pink walls! Oh Jan, I am so sorry, but think of it this way, you have such an amazing home one mistake is a small price to pay, I know in the end you will have a beautiful laundry room, and this will all be a distant memory. Can't wait to see the find finished room. oh dear, what a tale you have told! I am building a house and lose sleep over wondering what mistakes I have made... although, nothing is ever permanent and can be fixed (although some fixings take time and money!). Good luck choosing some wallpaper! Hi Jan ,I painted my bathroom coral and had a " Oh my god what have I done" moment too. Turns out it was the lighting. 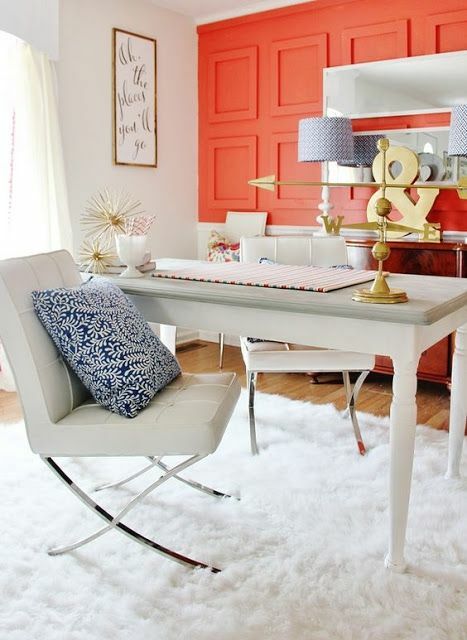 I flipped my frosted glass sconces to shine light down instead of up, and all of the sudden the color became warm and fun and brilliant. Try playing with lighting before you drive yourself crazy and to the poor house. 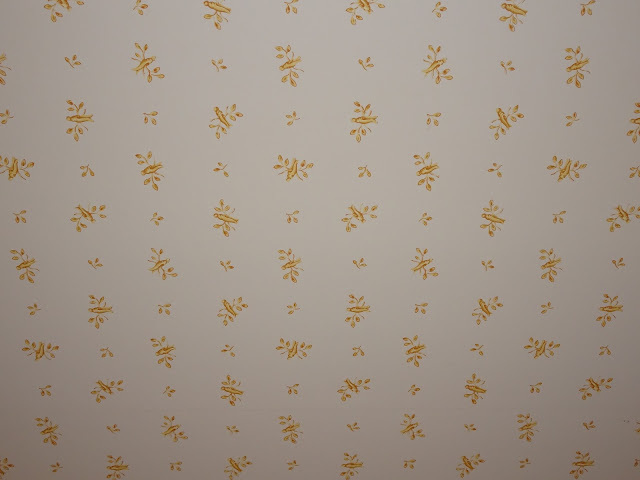 Also...Have you considered doing Courtly Check or Parchment Check wallpaper or borders? You've already got some serious MC love going on. Have you seen my powder room?!? It's really fun wallpaper. Xo Andrea stieff P.S. So envious of your laundry room, it's beautiful no matter what. I just redid my garage (yes, garage) and didn't go with my first choice of SW Waterscape and went with a safe, but very boring beige. I knew immediately it was wrong and had to be changed! All my friends told me I was crazy for spending the money to change it, but I did, and I absolutely love it. It makes me smile every time I open that garage door! Lesson learned, somehow make your design dream happen and go with your first choice! 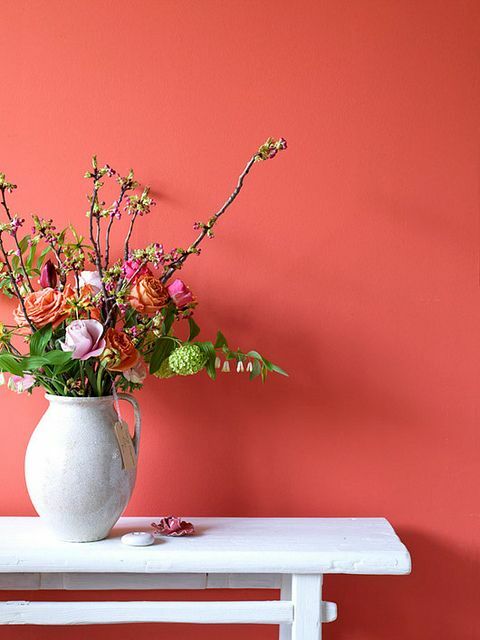 Thank you for such a beautiful and creative blog. Thank you Cindy Weis! I do feel confident that the end product will be worth the effort! Thank you Angelica!! I agree - everything can be fixed! Andrea, I have explored the MC website for hours.. 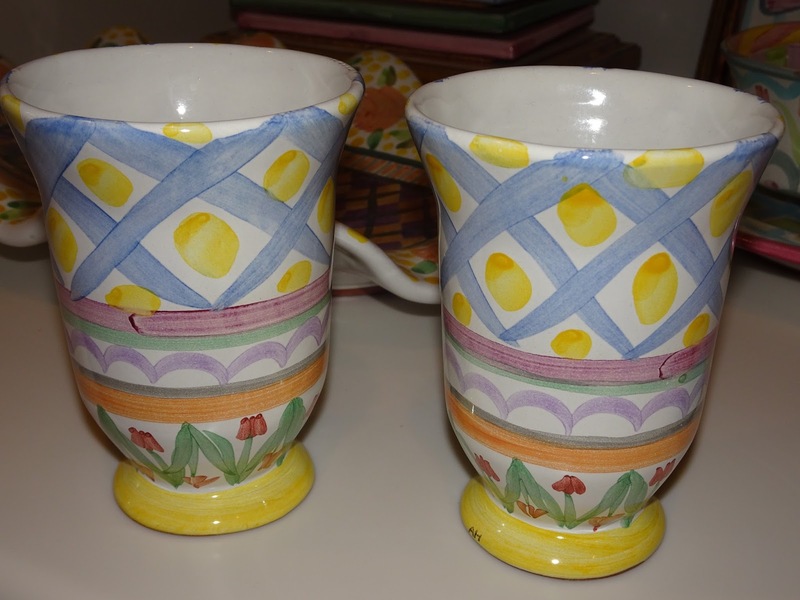 I am freaking out that they are offering the Taylor Ceramics for a limited time!! Just what I need - another distraction! Zoe - you sound like my kind of woman! I have been begging to paint my garage! I actually was suggesting that I do it myself! I would probably be hospitalized if I attempted that big of a project..
Jan, it's fun to see your room transforming. I love all the Taylor pieces. Great find on the tiles. Most of my Taylor ceramics are in a cupboard, but this makes me want to bring them out for display to join my tea pot, and a few other pieces up above the kitchen cabinets. Need to give this some thought!